Located in Pavilion Kuala Lumpur, Al-Amar Lebanese Cuisine is this rather luxurious restaurant serving Lebanese and western flavour cuisines. This was my first time dining here, thanks to I Love Discounts who invited myself and a few other friends for Al-Amar's Sunday Lunch Buffet. Upon hearing the word food, what more some special Lebanese food, I immediately took up this chance to sample their buffet spread. My first impression of Al-Amar was that it really looks the part of an exotic Lebanese restaurant, complete with the looks and environment. There was even a strong waft of lamb floating around the restaurant, which isn't really bad if you're in the mood to eat. 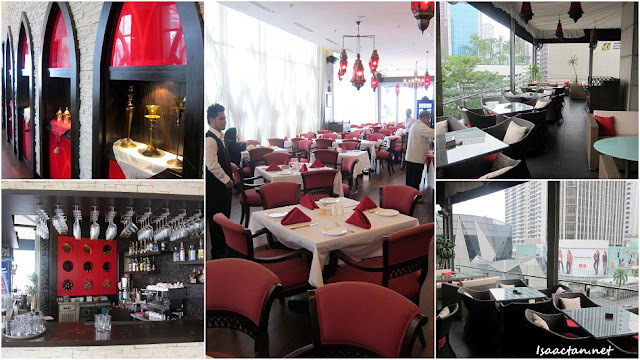 Al-Amar Lebanese Cuisine was established in July 2008, successfully assimilating classic and modern decor with authentic flavors to be one of the rather successful fine dining restaurants in Pavilion KL. There was even a new section with open view overseeing the streets of Bukit Bintang below, which is really nice. One could just sit there to chill out with friends, having some good food with a view. Anyway, we were there for the good food, and after a brief introduction of the restaurnt by the owner Joseph, who hails from Beirut, Lebanon, it was time to check out the buffet! Part of the buffet spread which consisted of lamb, seafood, and chicken dishes. A quick count of the dishes available for Al=Amar's Sunday Buffet consists of all the food as listed below. Check out some of the photos I managed to capture of all the food below. I would say the choices were really varied, and there's bound to be something to cater for everybody's taste bud. #2 A platter of assorted meat, "hot and cold mezzes". #3 More mezzes to fill your stomach with. #6 I really like this dark chocolate cake, bitter enough to kick the taste buds. #7 The Drinks, one of which caught my attention which was the really nice dates juice on the left. So there we were, having all these good food while chatting with the owner and his top marketing man, Ralph. The place was really cozy, good enough to actually just sit there and relax the afternoon away. As this was my first time experiencing Lebanese food, some of the taste didn't really go well with my taste buds, but I did try all the dishes there. Surprisingly, I enjoyed most of the dishes that afternoon. At RM75.40 per pax, Al-Amar Lebanese Cuisine's Sunday Buffet may come off as rather pricey, but ILoveDiscounts is having this on-going deal now for a further 31% reduction at only RM52 per pax. Do check out their link below to access this deal. wow..the food really look good! but pricey a bit la.. for i cannot eat much... anyway, an eye opener for me.. never seen lebanese food before..
Haha, shhh, not putting that picture up. For my own pleasure only. haha. Shisha is kinda cool, but gives me a headache after. Lebanese food quite ok la, but there are a few here and there which was not my taste. whoaaa Bro,I Love the Classic view yet the modern serving style one.. ^_^.v.. Nice!! wow..so much variety of food! I've never tried Lebanese food, but looks good actually. I have never tried Lebanese food before. The decor of the restaurant is lovely!! !